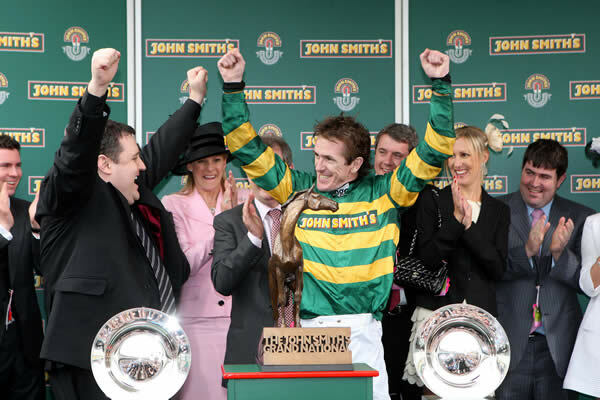 Fourteen times Champion jockey Tony McCoy won the Grand National at Aintree on Saturday, the world’s most famous steeplechase. 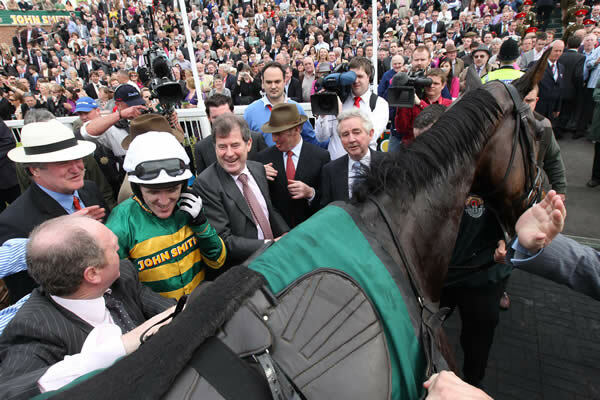 After fourteen attempts dating back to 1995, an emotional McCoy couldn’t hide his joy when winning the race which had eluded him for so long. Victory prevailed riding the Jonjo O’Neill trained 10/1 joint favourite ‘Don’t Push It’, a 10 year old bay gelding by ‘Old Vic’. For millionaire owner J P McManus, this win was also long overdue after 33 attempts since his first as an owner in 1982. A maximum field of forty runners lined up to tackle the awesome Aintree course. 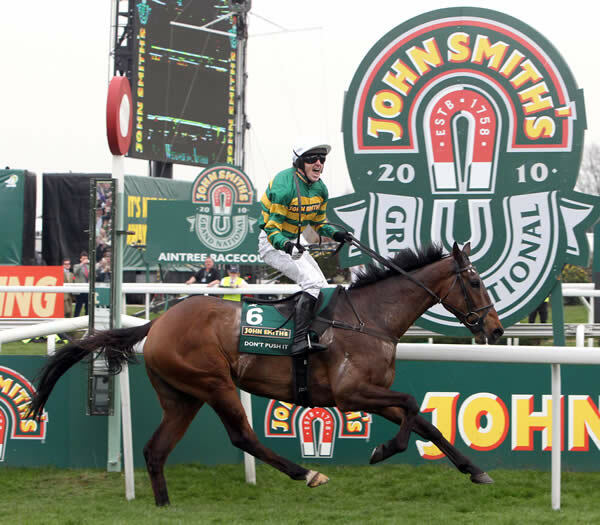 The four and a half mile race with 30 fences has a total prize fund of 925,000 pounds and is arguably the toughest test of horse and jockey in the world. An estimated 100 million pounds is wagered on the race each year with this year’s outcome costing the bookmakers an estimated 50 million pounds. Runner up Black Apalachi was prominent throughout but McCoy was always stalking him on the second circuit before jumping the last together and pulling clear to win by five lengths. ASPCA Maclay winner Michael Murphy on Winnetou (Owner Elizabeth Patz) Tournament of Champions at the Bob Thomas Equestrian Center. Photo © 2010 Lindsay Y McCall/PMG. 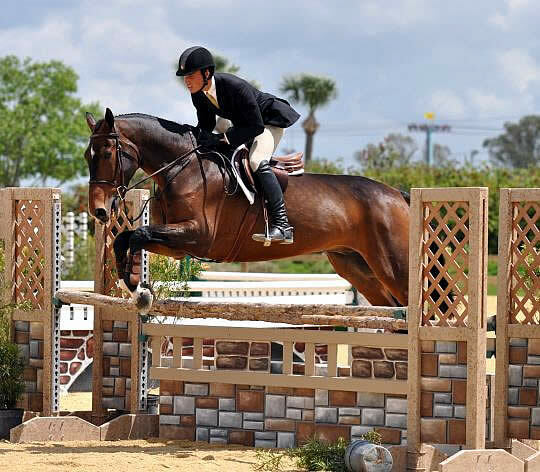 Tampa, FL – April 8, 2010 – Riders brought forth their finest efforts in the equitation classes at the Tampa Equestrian Festival’s Tournament of Champions held at the Bob Thomas Equestrian Center at the Florida State Fairgrounds. Earning the top accolade in the ASPCA Maclay Horsemanship class was Michael Murphy aboard Winnetou. Testing Robert McCune’s equitation course to first place in the Pessoa USEF Hunt Seat Medal was Shawn Casady riding Eastwood. These outstanding riders exchanged placings in the equitation classes when Murphy won the ASPCA Maclay Horsemanship, while Casady rode into second place. Then, Casady earned the blue ribbon in the Pessoa USEF Hunt Seat Medal class and Murphy took home the second place prize. LEXINGTON, KENTUCKY — Once again, the Rolex Kentucky Three-Day Event, this year Presented by Bridgestone, will host a truly international event at the Kentucky Horse Park in Lexington, KY, April 22-25. The Rolex Kentucky Three-Day Event, part of the HSBC FEI Classics Series, attracts many of the world’s best horses and riders as they vie for their share of $250,000 in prize money. Margie Engle and Indigo were the winners of the $50,000 Grand Prix of Tampa CSI 2*-W after completing a clear round over the fences, but crossing the finish line with two time faults. Photo By: Anne Gittins. Tampa, FL – April 4, 2010 – There were no rabbits this Easter at the Tampa Equestrian Festival during the $50,000 Grand Prix of Tampa CSI 2*-W. When four riders were unable to complete today’s jump-off round without bringing down a rail Margie Engle and Indigo were determined to have a steady, clear ride. The pair left all the jumps standing, and despite accruing two time faults, Engle and Indigo claimed today’s top prize. 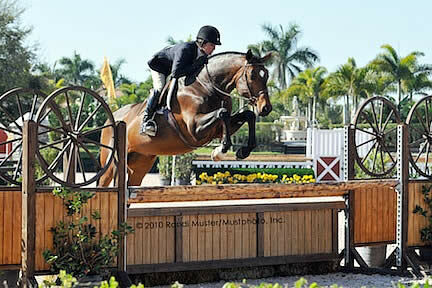 Today, riders competed over courses designed by Michel Vaillancourt in the Covered Arena at the Bob Thomas Equestrian Center at the Florida State Fairgrounds. The first round featured an early triple combination to a liverpool fence, followed by a triple bar. As the course came to a close, riders had to show over a large oxer line, followed by a tight double combination, before finishing over a tall, single vertical. Many riders had a difficult time at the oxer line, the double combination, and the final vertical. Six riders were able to complete the first round without fault and advance to the jump-off. The course began with a bending line, and then riders could take a difficult inside turn to a vertical, before making another inside turn to the second half of the triple combination. Finally, riders made their way to the triple bar before galloping to the tall vertical and finishing over the final oxer. 1st Annual International Gay Polo Tournament Was a Success! The Equestrian Life Team wins the 1st Annual International Gay Polo Tournament with team members Chip McKenney, Juan Bollini (professional) Gordon Ross, and Tom Landry. Website. Photo © 2010 Lindsay McCall/PMG. Wellington, FL – April 5, 2010 – The First Annual International Gay Polo Tournament was a huge success on and off the field. 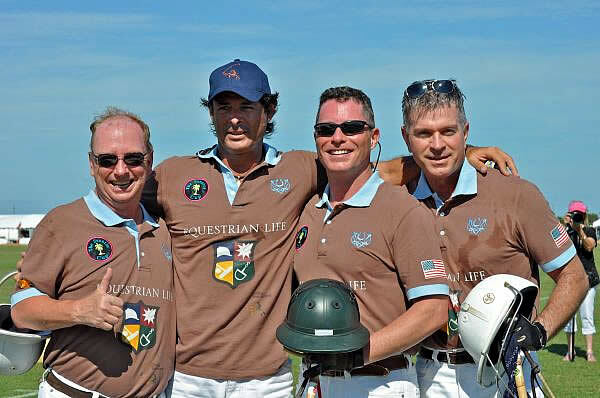 Equestrian Life, led by 6-goaler Juan Bollini, edged bluhorse 4-3 to win the championship game played in front of almost 1,500 spectators at Grand Champions Polo Club in Wellington. In the preliminary game, 7-goaler Jeff Blake scored on a breakaway with 31 seconds remaining to lift Step by Step Foundation over Buchanan Screen, Rail & Windows 5-4. Blake scored all five goals for Step by Step. Nine-goaler Nicolas Roldan scored three goals for Buchanan Screen, Rail & Windows and Jack Hoffman added one goal. Bollini scored both of his goals in the final chukker to lead Equestrian Life. Gay Polo League (GPL) Founder and President Chip McKenney and Gordon Ross also scored for the winners. Lexington, KY – With the opening of the 2010 International Equestrian Festival (IEF) just six months away, the Horse Radio Network, producers of the 2010 Radio Show and six other shows, announced that it has reached broadcast deals with over 30 affiliates – expanding their audience to 37 countries – and announced plans to broadcast daily from the IEF as the Official Equestrian Radio Partner. The programming includes daily world championship competition results from the eight sporting events held at the Alltech 2010 World Equestrian Games, interviews with equestrian athletes, and fun-filled IEF coverage. The International Equestrian Festival, held in the Lexington Convention Center, from September 25 through October 10, 2010, is located in the official host city of the World Games. The Horse Radio Network will join Presenting Sponsor HRTV (Horse Racing Television) in providing exciting coverage of the event’s entertainment, education and tourism components. The radio crew is led by the executive producer of the Horse Radio Network, Glenn the Geek, a pioneer of equestrian podcast entertainment with over 20 years experience in the entertainment industry. Glenn will be joined by British horsewomen and co-host of The 2010 Radio Show, Samantha Clark, at the IEF anchor location. 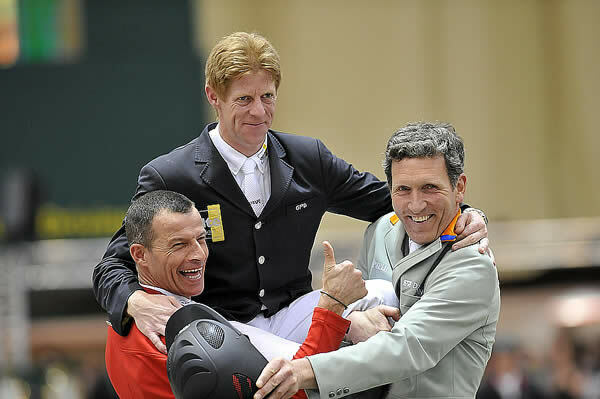 Attendees of the IEF and the 2010 WEG are encouraged to gather for the show and participate in the coverage. Wellington, FL – April 1, 2010 – This is the last week of the 2010 FTI Winter Equestrian Festival (WEF) for hunters to secure a tricolor, and Sandy Ferrell and Showman, owned by Alexa & Krista Weisman, ended on a great note when they received their third championship of the twelve-week FTI WEF in the Western Hay & Suncoast Bedding First Year Green Working Hunters. Alexa and Krista Weisman bought Showman from Scott Stewart and Ken Berkley about two years ago, and owner Alexa Weisman also competes with her mount in the Amateur Hunter divisions.